Multi-academy trust leaders must be prepared to make “ambitious and bold” changes to drive improvement, and should avoid burdening teachers with bureaucracy, according to the founder of a chain regularly praised by ministers. 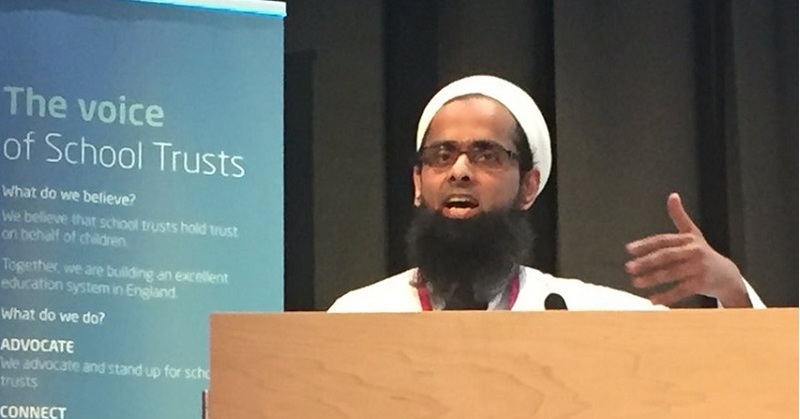 In a rare public intervention, Mufti Hamid Patel, chief executive of Star Academies chastised schools that defend curriculums that don’t deliver results for their pupils, and stressed that no child should be seen as incapable. Star Academies has 24 schools, most of which are in the north west and Midlands. Ten of the trust’s schools are rated ‘outstanding’, and its founding school, Tauheedul Islam Girls’ High School, has the highest Progress 8 score in the country. The trust is a favourite of ministers in Whitehall. Just last year, Nick Gibb, the schools minister, praised Star – which at that point was called the Tauheedul Education Trust – for showing that “geography need be no barrier to academic achievement”. Addressing the inaugural conference of the Confederation of School Trusts, Patel said the success of his first school was driven by ambitious changes – a massive increase in pupil numbers from 277 to 800, a completely revamped curriculum, the creation of a sixth form and a completely new site. Patel, who rarely makes public speeches but received a CBE in 2015 for his services to education, did not hold back in asserting his principles for successful trust improvement. “Don’t compromise on the fundamental premise that all children deserve the very best and are capable of achieving the very best, irrespective of where they come from, what their background is, what they do,” he said. Patel also advised school leaders to avoid being “too bureaucratic, too officious”. Data drops at his school are handled with a single form for middle leaders, who have to set out performance, key issues and targets for the next half-term. He recommended “reverse delegation”, where senior leaders look to take pressure off their staff rather than pile it on. Leaders must “look for gains in every relevant area” in order to improve particular aspects of the way their school or trust works. For example, a leader from Star had recently advised a school in east Lancashire to look at the curriculum, teaching and learning at key stage 3 in order to improve GCSE English results. Even the timetable, rewards system and programme of trips for the subject were important to consider when looking at how to improve outcomes, he said. “All of this adds up, some small improvements in all of these areas deliver big transformations,” Patel concluded.